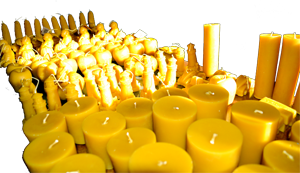 Golden Beeswax Candle Company is home based business owned and operated by Tracy Heirigs. Tracy’s love for beeswax started we she discovered foundation beeswax sheets at a local farmer’s market in Hermosa Beach, California. The beeswax candles provided a wonderful fragrance while serving as a stress reducer from her corporate job as an actuary. The candles not only burned beautifully creating a pleasant mood in the room but gave her a meditative activity as she handcrafted her rolled candles. The candle making kit in our online store has the same type of beeswax sheets. Tracy manufactures all her candles out of our new store in downtown Flagstaff with her three children; Jasmine, Benjamin and Beatrice. We purchase ALL our bee products directly from local beekeepers when available. Supporting beekeepers in their profession is an ultimate concern for us because of all the incredible ways bees contribute to our food supply and the natural balance of life. Tracy personally oversees all candle and body care production and guarantees her customer’s satisfaction.